This luxury house is situated beside the 18th green and 2 mins stroll to the Vila Sol resort clubhouse /course & tennis courts. The house has a communal superb pool and an upstairs bedroom overlooks the 18th green. The adjacent new hotel has all the facilities expected of a 5* resort. The Portuguese Open has twice been held at Vila Sol Resort.. Vilamoura is 8-10 mins drive where there are several renowned golf courses - Old Course, Millennium, Ocean, Pinhal and Victoria Course. A water park is a 5 minute drive from the house. At the entrance of Vila Sol resort - walking distance from the house - are bars/pubs, an Italian Restaurant, a patisserie and small shop. The nearest beach is a 5 minute drive away. There is an excellent large supermarket in Almancil only a 5 minute drive from the house. We are a professional couple with 2 children living in Ireland. Fantastic location with glorious pool, championship golf course, driving range and tennis courts. Beautiful townhouse equipped with everything you need and more, overlooking one of the swimming pools, surrounded by vast grass area and large terrace. Vilasol is only a 5 minute drive from the Vilamoura Marina with lots of restaurants and shops, but only a few minutes walk to the friendly on-site Oscars bar, Italian restaurant and Tapas wine bar which offers great food, drink and entertainment. Great communication with owners, everything ran very smoothly, would thoroughly recommend. En-suite bathroom with jacuzzi bath, shower, wash basin, WC and bidet to master bedroom. Bathroom for bedroom 2 with bath and shower, bidet, WC and wash basin. Shower room with WC and basin adjacent to bedroom 3. Separate WC. Spacious lounge/dining room with 2 sets of patio doors leading to large patio area which gives access to the pool area. Furnished to a high standard with leather L-shaped sofa, dining suite, smart TV / wifi, Air Con. Contemporary kitchen with granite work surfaces, all the ‘mod cons’ including dishwasher, large refrigerator/freezer, oven, kettle, toaster and microwave. All utensils provided. Some children's DVD's available for your use. Large seated balcony off the master bedroom. Small balcony off a guest bedroom. Large terrace with dining table and 6 outdoor chairs. 2 terrace loungers with 4 further portable loungers. 2 tennis courts beside property. 1 min stroll to the Vila Sol Golf Course. The Course was designed by Donald Steele and has staged the Portuguese Open twice and been host to the Sir Bobby Robson Golf Classic for Charity twice. There are numerous other fantastic courses nearby in Vilamoura (The Old Course, The Millenium Course, Pinhal, The Ocean Course and The Victoria Course, which hosted the 2005 World Golf Championship. There are also the other excellent courses within a 10 min drive away at Quinta do Lago and Val do Lobo. Th house is over 3 levels with 2 in house stairs. There are 4 steps to the front door. Notes on accommodation: This townhouse is exceptionally decorated that surpasses what hotel rooms have to offer. The property has air conditioning (hot & cold) on over the 3 floor levels. It is very child friendly with child facilities and a gate from the large outdoor patio to the pool area for safety. Outside: Large terrace with table and chairs and recliners. Terrace leads to the lovely communal pool area and tennis court nearby. Utility Room: Washing machine and airers. Cleaning / Towels / Linen / Maid service: Towels and linen provided. No beach towels are provided. Other: There is ample car parking surrounding the property. The house upon arrival was spotless and very spacious, everything you needed was on hand. The golf club beside was very nice serving a beautiful lunch. 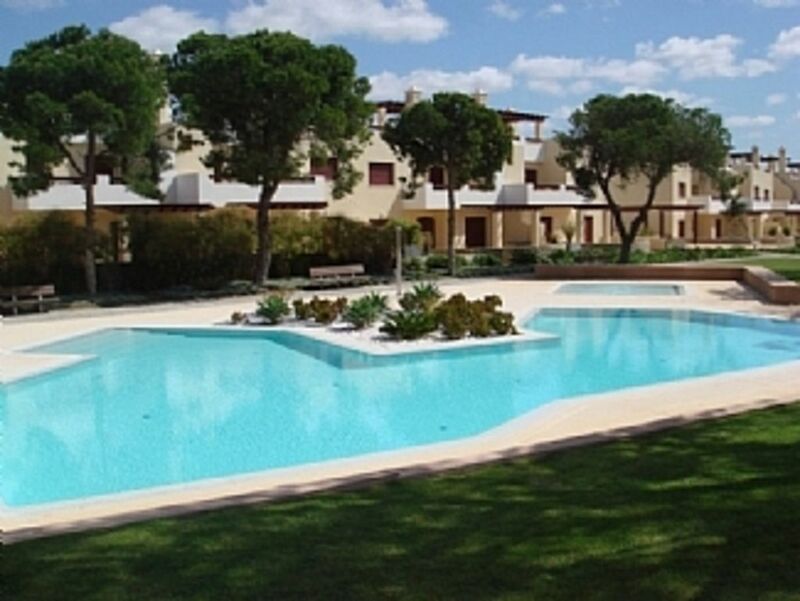 Only a few minutes drive from gorgeous beaches and the fashionable town of Vilamoura . two superb restaurants nearby called diplomatico and La Cabane In quarteira serving delicious local produce!! would recommend to anyone!! Incredible location & property. A super holiday spot. House & pool area was out of this world. Fantastic property that catered for all our needs. Amazing property, everything you could need is in it, and spotless clean. Could not fault this property in any way!!! The beaches at Vilamoura and Quarteria are 5 mins drive. The apartment is 15-20 mins drive away from Faro Airport, the transfer cost is approximately 35 euros each way in a taxi. Lisbon and Sevilla airport in Spain are approx a 2 hour drive from The Algarve and often offer competitive fare’s. Vilamoura is roughly 5 mins drive. Quinta do Lago and Vale do Lobo about 10 mins drive. There is an Aqua Park 2 mins from the entrance of Vila Sol and a go-karting track at Almancil which is about 5 mins drive. Zoo Marine is also available locally. There are some lovely villages a short distance to drive. Local markets in Boliqueime - last Thursday of the month, in Quarteira - every Wednesday of the week, in Loulé - every Saturday morning, in Almancil - 1st and 4th Sunday of the month. Flea markets in Almancil, 2nd Sunday of the month. Some of the local attractions include Aqualand - Europe's biggest open-air water park, set in a landscape of shady palms and trim gardens with lots to do between getting dunked. Estrada Nacional N125, Alcantarilha (within 20 minutes drive) and also Aquashow at only 2 minutes drive from the house. The Zoomarine - a theme park, part zoo, part funfair- is located in the main local road, Estrada Nacional N125, at Guia, within 20 minutes drive. Roma Mini-Golf Park - near the marina in Vilamoura, where life-sized replicas of villas, arcades and an amphitheatre reflect the Roman theme designed around the layout. Karting - If you like to race in a karting car with your friends and family, there is a go-karting track at Almancil (5 minutes from the house). Vilamoura is reachable within 3 minutes drive. There you will find the famous world class golf courses, mini golf, the popular Marina of Vilamoura, Lusomundo Cinema (films in English), bowling and the gorgeous beaches of the Marina and Praia da Falésia. The Marina of Vilamoura has fantastic boats, international restaurants, shops, bars like Figo's Bar '7', 'El Salero', 'Irish Pub' and 'In bar' (with Sky sports, large screens, live music, karaoke). The biggest disco in the Algarve, 'Kadoc Disco and Kadoc Clube' very popular for the great parties with international DJs. Algarve Shopping is considered the biggest commercial centre in the Algarve, its complex offers a wide range of shops, a hypermarket, 9 cinema screens (films in English), ten-pin bowling, fast food like KFC, Mcdonalds and Pizza Hut (15-20 minutes from Vila Sol). Booking Notes: Email or telephone with preferred dates. There is a non-refundable deposit of £200/250 euros on booking. Full payment is due 6 weeks before arrival. There is also a refundable breakage deposit of £200/250 euros which is payable with the balance and will be returned after your holiday. Payment can be made by cheque/Bank money transfer. Changeover Day: Guests must vacate the property no later than 11:00am on the day of departure and check-in time is 2:30pm. If you require a later check-out time or an earlier check-in time, please contact us in advance. Notes on prices: SPECIAL OFFER: LAST REMAINING WEEKS IN JUNE £550 per week Prices are for the property per week in Euro 10% discount for stays 2 weeks or more. Please email for daily rates/3 night breaks. Further discount available for last minute bookings, please contact for a quote. A mid stay cleaning service is included in the cost of bookings of two weeks or more. Details of a cleaning service is available in the property should it be required.